Pack your survival kit. Almost every story in this anthology, which features contributors from around the world, takes place in a post-apocalyptic landscape, signaled by such ominous phrases as “the Aftermath”, “the Event”, “the Last Great War” and “the End Times”. Breadcrumbs, dragons and knights become high-tech tools, sometimes used for murderous purposes. The cautionary tale is taken to dizzying heights, featuring characters who stand up to learned fears and communal limitations with varying degrees of success. Strong female characters, many of them mere children, are everywhere. The young heroine of “SmallMarg and the Star-Heart” discovers the source of her society’s current troubles when she lets curiosity overcome fear. In the world of “The Rawheads and the Little Girl”, young females live under the threat of physical violence from two different tribes, but this does nothing to deter the heroine from learning about the past. Hoping to save her people, the heroine of “Thirst” searches for a mysterious Citadel, only to discover its horrifying truth. Similarly a young girl and her friends must uncover the true nature of the world of their upbringing in “Wolves At the Door”. 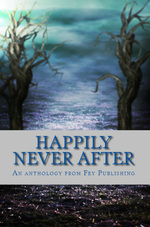 Several stories fast-forward traditional fairy tales and fables into a new and unsettling zone. “The Law of Mirrors” presents a totalitarian realm where all reflective surfaces, as well as words like “beauty”, are outlawed. “Glass Fifty-Three” is a futuristic retelling of “Cinderella” that explores class, race and technology while bringing a couple together in a dangerous union. In “Tiesa’s Truth”, set after the supposed demise of humans, a fairy learns that there are more options than she has dreamed of in life and romance. “Something Wicked This Way Spun” follows a romantic rivalry to a startling conclusion. A new form of incarceration is explored in exhaustive detail, with a big dose of dry humor, in “Notes from the Belly of a Whale”. 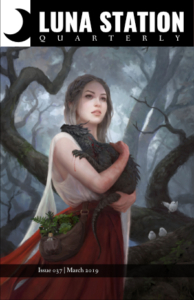 The heroine of “Beware: Here Be Dragons” is stalked by a lunatic who runs a nightmare kingdom of lethal gadgets from which she must rescue herself. “The Door Mouse Does Death a Favor” features a standoff between Death and a surprisingly formidable adversary. Family and community are perhaps the most important of the unifying themes in this collection, for what else can we cling to, or hope for, in a dystopian setting? In “The Rumpled Man” a thief suffers a degree of loss she could never have foreseen when she steals a mirrored box. “Mr. Trueworthy” shows what happens to those who live only for money, divorced from any possibility of community. And “Iron Henry”, with its Dickensian backdrop, is the story of a young man willing to sacrifice everything in the name of family. Taking risks is the only way for the characters in this anthology to arrive at an understanding of their troubled worlds. In the highly effective “Rat-a-tat-tat”, a brother and sister venture into the forest in search of a better life even though a legendary monster is said to dwell there. As young Paul reminds his more cautious sister, passive acceptance gets a person nowhere: “He’s a myth, Isme. Something overprotective parents tell their children to keep them ferreted away. Ma told you about Top-Half so you would spend the rest of your days living in fear. Yeah, you’d be safer never leaving the house, but what kind of life is that? If the bandits or the cannibals want to get us, they’ll break in and take us. As simple as that.” We are left to decide if the siblings have made the right choice–and what we would do in their place. Prev The LSQ staff has a few new faces! Next Reader’s Perspective: What is your favorite last line?